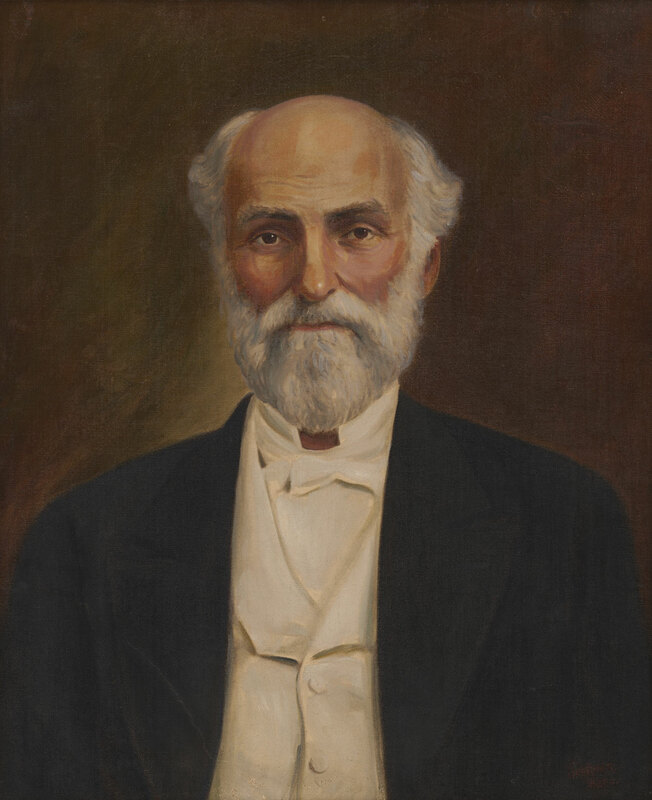 Painting, Portrait of Rufus Columbus Burleson, located at Baylor University. Courtesy of Baylor University Libraries. Image available on the Internet and included in accordance with Title 17 U.S.C. Section 107. BURLESON, RUFUS COLUMBUS (1823–1901). Rufus C. Burleson, pioneer Baptist minister and college president, the son of Jonathan and Elizabeth (Byrd) Burleson, was born on August 7, 1823, near Decatur, Alabama. His mother was descended from the Byrd family of Virginia. He entered Summerville Academy in 1837 and remained for two years, then spent some time at schools in Danville and Decatur. His desire was to be a lawyer. After a religious conversion in April 1839, however, he felt a call to preach. He matriculated at Nashville University in 1840 to prepare for the Baptist ministry, but ill health forced him to withdraw in 1841. He studied Greek, Hebrew, and Bible history while recuperating at home. After the return of his health he taught until 1845 in Mississippi, where he was ordained and served briefly as pastor of three churches near Starkville. Burleson entered Western Baptist Theological Seminary in Covington, Kentucky, in 1846 and received his diploma the following year. He was appointed for mission work in Texas by the Southern Baptist Domestic Mission Board and became pastor of the First Baptist Church in Houston in 1848. After a short, successful pastorate, he was elected in June 1851 to be the second president of Baylor University; he succeeded Henry Lee Graves. By constant advertising, traveling, and speaking over the state, Burleson brought relative strength and stability to Baylor. On January 3, 1853, he married Georgia Jenkins. On November 19, 1854, he baptized Sam Houston. Burleson's beginning at Baylor was marred by friction with Horace Clark. When the female and male departments of Baylor were separated, Clark became principal of the female department and wanted to act independently of Burleson. The conflict over authority eventually degenerated into a personal feud, which, along with an invitation from a more promising area, led Burleson and the faculty of the male department to move to Waco in 1861. Burleson became president of Waco University, and the school flourished under his leadership. In 1865 it became coeducational and by 1868 was receiving support from the Baptist General Association of Texas, which included most of the northern part of the state. Photograph, Picture of Rufus Columbus Burleson. Courtesy of Find a Grave. Image available on the Internet and included in accordance with Title 17 U.S.C. Section 107. Meanwhile, Baylor and the Independence area, having been bypassed by the railroad, were in economic difficulty, and the schools were merged in 1886 as Baylor University with Burleson as president. Under his leadership Baylor was able to achieve a permanent position of prominence in Texas education, although not without controversy. His battle with William Brann, editor of the Iconoclast and constant critic of Baylor and Baptists, erupted in 1894, when a young Brazilian girl living with the Burlesons was found to be pregnant. Brann championed the girl and suggested that Burleson was guilty of improprieties. Even after a grand jury found Burleson innocent, Brann continued his attacks on Burleson's attitude toward the girl. The incident resulted in the departure of some thirty-five female students from Baylor and heightened the feud between Brann and Baylor. In 1897 Baylor moved Burleson out of the presidency and made him president emeritus, a demotion he believed was a direct result of the Brann controversy. 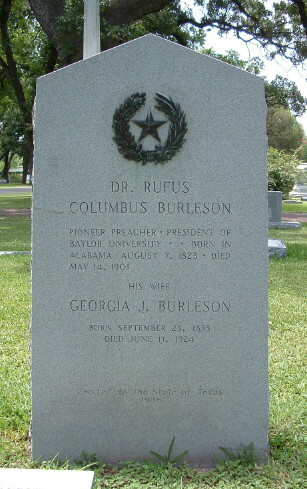 Photograph, Picture of the gravestone of Rufus Columbus Burleson. Image available on the Internet and included in accordance with Title 17 U.S.C. Section 107. Burleson served as pastor in Houston, Independence, and Waco and was guest preacher and revivalist in many Baptist churches and associations over the state. He was elected president of the Baptist General Convention of Texas for 1892–93. He also made an important contribution to public education in Texas. In 1869, at the request of Barnas Sears, he began to work unofficially for the Peabody Education Fund, established to work for public education. The fund wanted a man who was respected and well known throughout the state as well as one who would be able to promote a system of public schools. Burleson overcame opposition to public schools, partly by proposing ways to improve teaching. He advocated holding teachers' institutes in various cities and establishing a state teacher-training school. He was also instrumental in the founding of Bishop College; while in New York in 1872 he presented the need for a college for blacks to Nathan Bishop, who contributed at least $35,000 to the institution. Burleson died in Waco on May 14, 1901. Robert A. Baker, The Blossoming Desert–A Concise History of Texas Baptists (Waco: Word, 1970). Georgia J. Burleson, comp., The Life and Writings of Rufus C. Burleson, D.D., L.L.D. (1901). Encyclopedia of Southern Baptists (4 vols., Nashville: Broadman, 1958–82). Jack Winton Gunn, The Life of Rufus C. Burleson (Ph.D. dissertation, University of Texas, 1951). Harry Haynes, "Dr. Rufus C. Burleson," Quarterly of the Texas State Historical Association 5 (July 1901). Lois Smith Murray, Baylor at Independence (Waco: Baylor University Press, 1972). Handbook of Texas Online, J. A. Reynolds, "BURLESON, RUFUS COLUMBUS," accessed April 24, 2019, http://www.tshaonline.org/handbook/online/articles/fbu44.